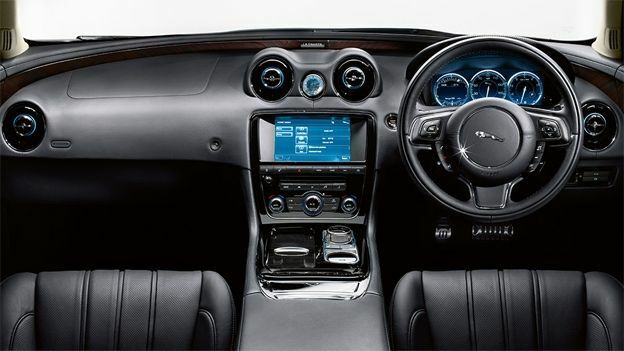 Jaguar have unveiled the Jaguar XJ Ultimate Edition, boasting a champagne cooler, heated steering wheel, Apple iPads in the rear seats and a 20-speaker surround sound system custom-made by Meridian Audio. Designed to be the pinnacle of the Jaguar XJ range the Ultimate Edition is crammed with advanced technology, most notable of which being the impressive Meridian 20 speaker surround sound system. Using 20 speakers and 15-channels of amplification Meridian have used what they're calling Trifield technology to create the illusion that every passenger including the driver is listening to music that is directly aimed at them. To accomplish this the car has not only 20 speakers but two subwoofers creating a virtual 7.1 surround sound system which can throw out a staggering 825 watts of audio. If that wasn't enough the car comes with two Apple iPads in the rear seats for entertainment while screens mounted in the headrests also offer multimedia features that are integrated with the car. FInally to help pass the time in style there's a champagne cooler in the back along with two handcrafter Goran Hongell champage glasses. There's no word on pricing or indeed when it's available but expect it to be on the premium end of the price range.